Confession #127 – Despite me always telling people not to worry about the Instant Pot blowing up, tonight – for a hot minute – I worried just a little. I mean, I had that sucker packed right up the max line. But, as usual, my Instant Pot didn’t let me down. And thank goodness…because the thought of cleaning meatloaf, carrots, and mashed potatoes off of my ceiling for the next ten years just isn’t appealing. 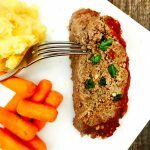 Seriously, though, this dinner is just another reason to love the Instant Pot …the fact that you can cook mashed potatoes and carrots along with a meatloaf in one pot in just over 30 minutes is pretty darn amazing. It’s all about the layering process. First, I started with quartered potatoes seasoned with salt and a few cloves of garlic. Instead of using water, I added 1 cup of broth to give a little more flavor. Next, I placed the trivet on top of the potatoes and layered it with some foil, making a nice comfy home for the carrots to cook in. I added a couple of pats of vegan butter, covered them with foil and then I prepared my meatloaf. I used my Momma’s recipe for this again – it’s just so delicious and easy…and it’s what we all expect when we say we are having meatloaf. I mixed our usual blend of breadcrumb, Locatelli cheese, garlic, onion and seasonings into the meat and then I shaped it into a round loaf so it would fit nicely on top of everything else in the pot. After topping the loaf with sauce, I closed and locked the lid, set the Instant Pot for 25 minutes, and said a little prayer to my grandma to look out for our dinner. Before I knew it, 25 minutes was up and I really and truly had a Sunday meal ready for the family. 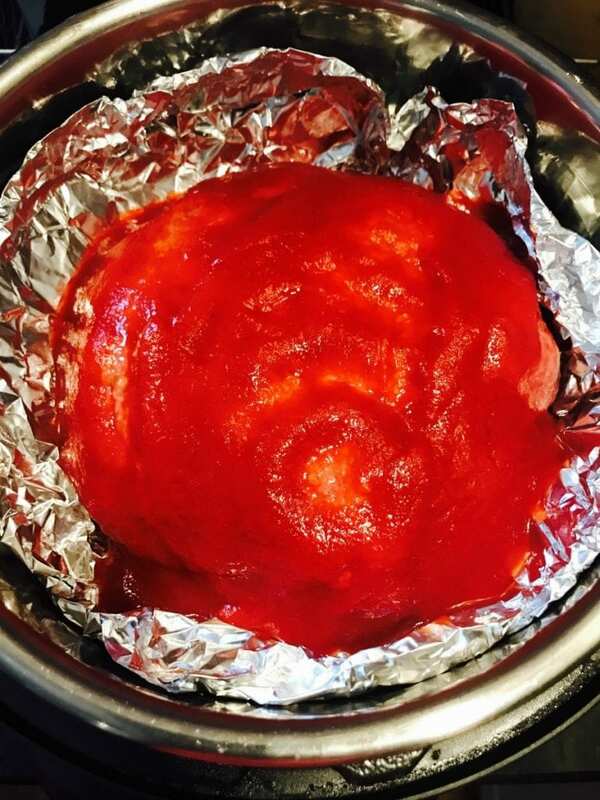 Another Instant Pot miracle! Because I love the way the sauce bakes on top of our traditional recipe, I carefully removed the meatloaf and put it under the broiler for a few minutes. This is totally optional, but yummy. The carrots were cooked perfectly, so no need to do anything there. And – oh – the potatoes. Can I just say, the Instant Pot makes the most amazing mashed potatoes. Like legitimate awesomeness. 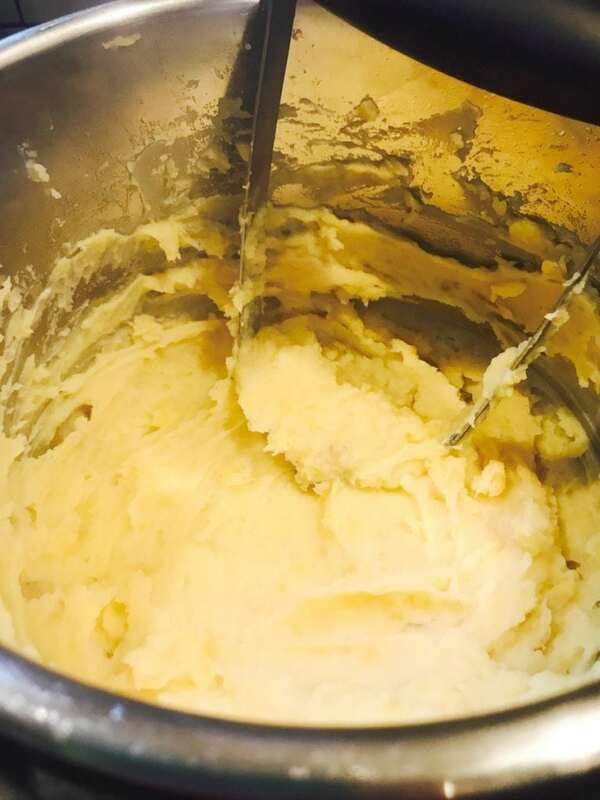 The pot is at the perfect temperature, so all you need is to drain them a bit (reserve the liquid for mashing) and use your handy potato masher to make the most incredibly smooth and creamy mashed potatoes. I added a little vegan butter and the broth from cooking into mine, and I didn’t miss the dairy at all. But feel free to add some milk or Greek yogurt for extra creaminess. That’s all you’ve gotta do! 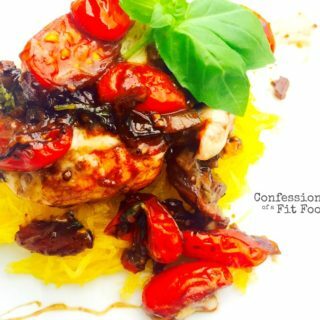 One pot to clean and one freaking fabulous and healthy meal! Way to go, my friend! 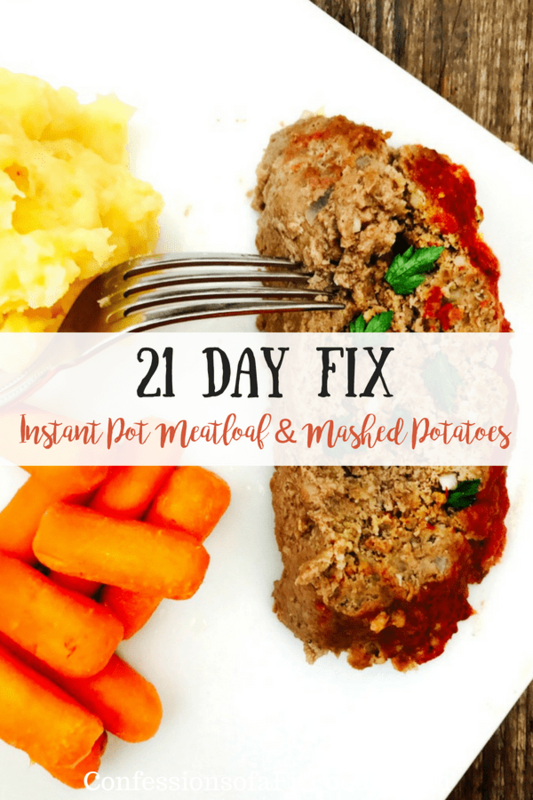 This 21 Day Fix Instant Pot Meatloaf and Mashed Potatoes dinner is truly a one pot miracle thanks to the Instant Pot! Cook your meat, veggies, and mashed potatoes all together in the same pot in under a half-hour of cook time! 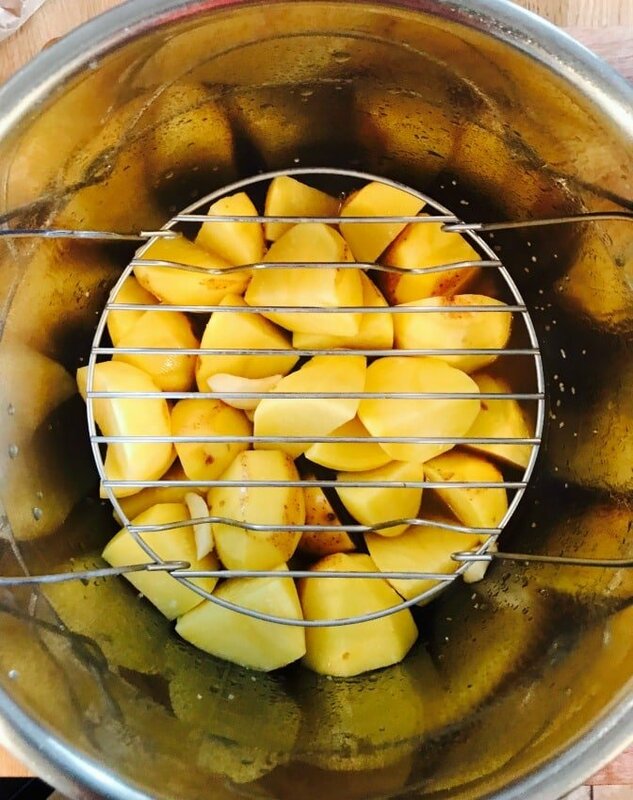 Place quartered potatoes, 3 cloves of garlic, and 1 tsp salt on the bottom of the Instant Pot. Pour in 1 cup of broth and then place trivet on top of potatoes. 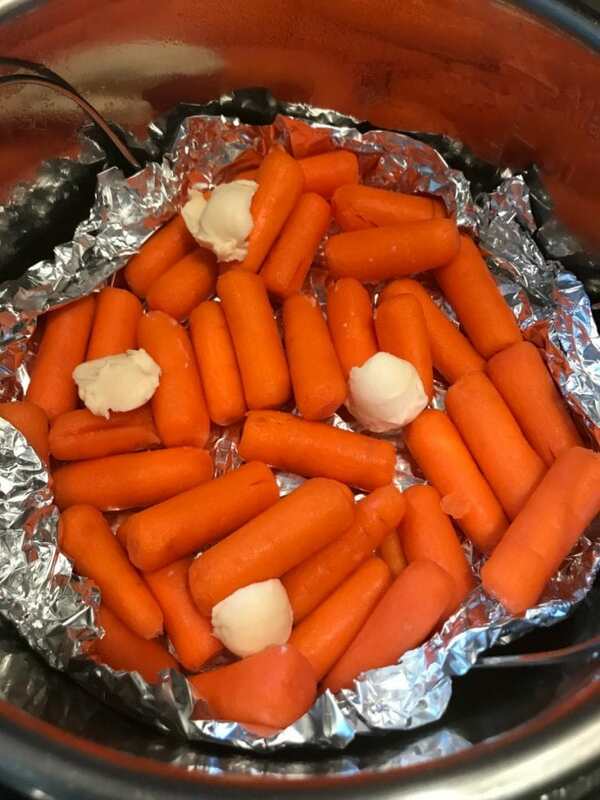 Lay a piece of foil down on trivet and place carrots in one flat layer on top of foil. Add 1 T of butter and cover with another piece of foil. Mix meat with breadcrumbs, onion, minced garlic, 2 T sauce, 1 egg, cheese and parsley. Shape into a circular loaf. Place loaf on top of carrot layer. Pour remaining sauce on top of meatloaf and place lid on IP. Lock and turn to manual, high pressure for 25 minutes. After cook time is through, quick release and open the pot once the IP releases all steam and unlocks. 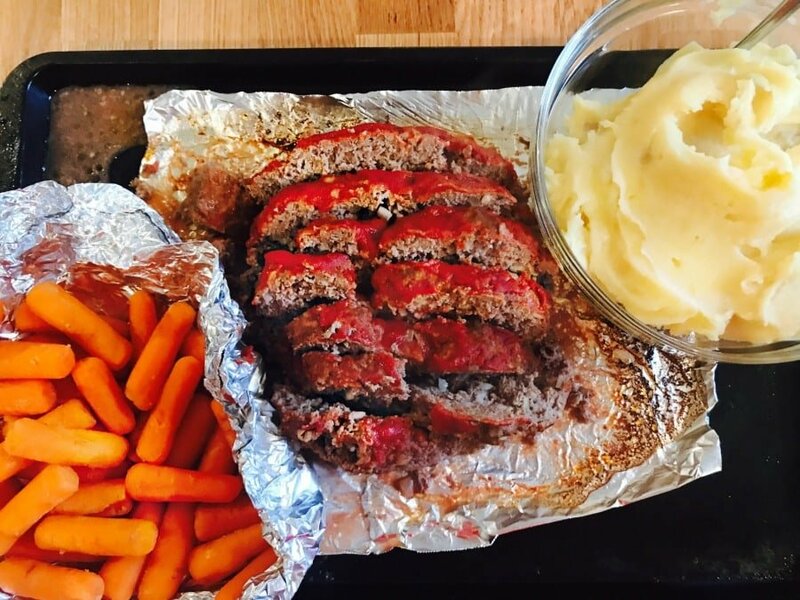 Carefully remove meatloaf from the top layer of foil and broil for 3-5 minutes, if desired. Remove carrots from pot. Then carefully drain potatoes, reserving broth. Using potato masher, mash potatoes, adding in broth and remaining 2 T butter in slowly. For extra creaminess, add in a splash of milk or Greek yogurt. Season to taste with salt and pepper. 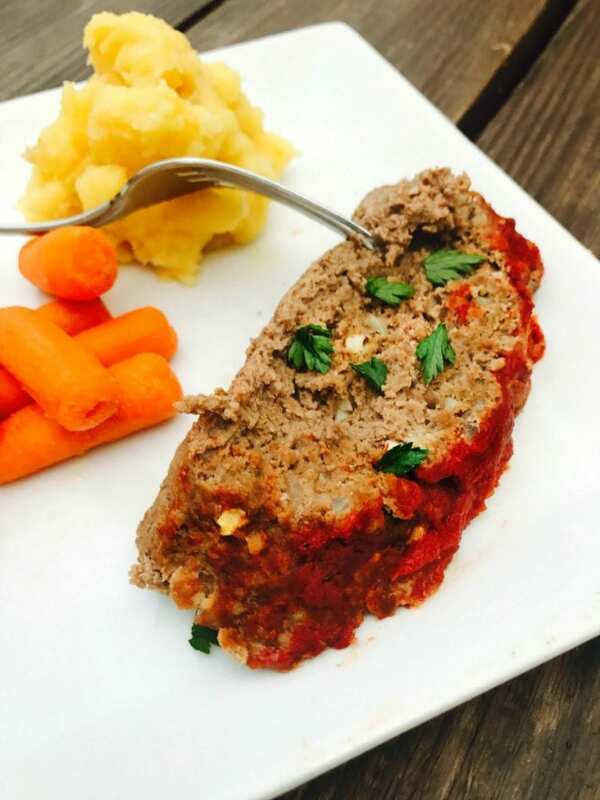 Meatloaf being a family favorite comfort food – I can’t wait to try this recipe! Sounds delicious!!! One pot meal I have ever made!!! Thank you Nancylynn! I’m a forever fan!!! You made my day, Trish! Thank you for your comment! I made this recipe. The meatloaf, carrots, and potatoes were so flavorful each layer in the IP tasted so good, next time I would use more broth on the potatoes. I can’t believe a whole dinner in one pot. You are a genius, Nancylynn. I know the next IP recipe I will make I will check your website first. Quite savory and delicious. Did you do a container count? I must b blind because I looked twice and didn’t see it. I have no idea where it went! But it’s updated now – thank you! It’s 1 red, 1 yellow, 1 green, 2 tsp, 1/4 blue! I’m looking forward to d to trying this. I am new go 21 Day Fix. Maybe I missed it but how many people does this feed? 2? I’m still getting the hang of the whole plan. Thanks for your help. Thank you! Making it tonight! I never thought to address cheese to meatloaf, I love pecerino in meatballs so this makes sense going to try this out soon! Yes! It’s the way my nanny always made it! Pretty much like a big meatball :). Can I do just the meatloaf? Any changes to that need to be made? Yes! Just place it in foil on the trivet so it doesn’t touch the water at the bottom! My brother and I just made this for dinner and it was a big hit! I wish I could post a pic to show you. Everything was moist. We also put it into the broiler as you recommended. Since I like spicy, I’m thinking of adding spicy tomato sauce next time. Thank you for saving dinner tonight. I think my husband was happy to have a home cooked meal. This recipe was so easy. It didn’t feel like some big chore to me. How long does this typically take to come tonprrssure? Also, if I needed to double the recipe, would I need to cook longer or add more water? Newbie here, sorry if these are elementary questions! can I make this in a regular crockpot? if so how long to cook? I made this, and the carrots and meatloaf turned out great. Unfortunately the potatoes stuck to the bottom of the pot and seemed under cooked. My pot did not reach high pressure. When I went to release the pressure, it was already unlocked and no pressure came out. Ok – my first question is what size IP do you have? Made this tonight. It was delicious and so much fun to make! Thanks for the recipe! That’s awesome! I love when cooking is fun! I love it! Thanks for the tips! I wanted to share one back with you from my cold-pack canning experiences … no matter how tightly full I pack fresh produce in a clean jar, even small or well-packed items like cherries, okra, or beans stood long-ways, I still end up needing 50% syrup or brine for each jar, which means it was still 50% air even after packing it full to the brim! And I’m good at packing tightly! Can you still overfill a pressure cooker? Certainly! But there’s a lot more air hiding in the spaces in your layers than it looks like when it’s not full of liquid. ? Very true! Thank you, Brittany! 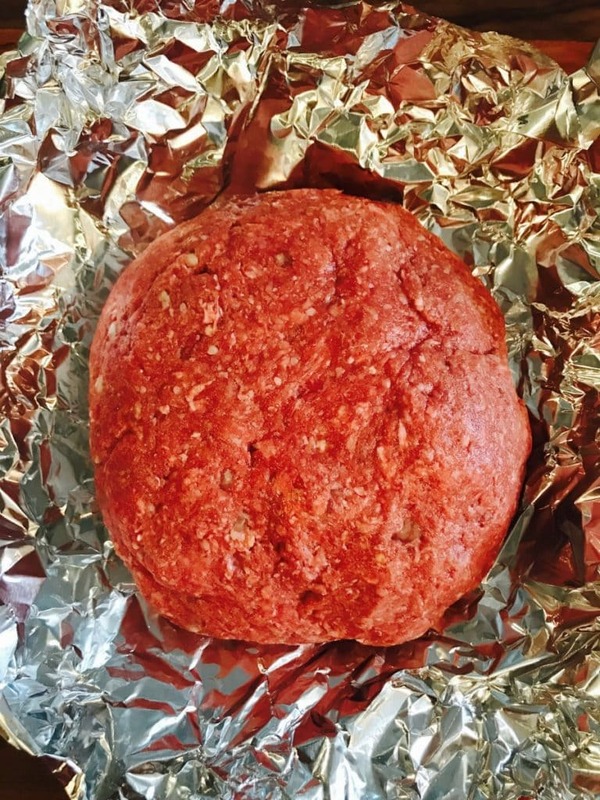 Has anyone tried using ground turkey instead of beef? My daughter will be staying with me for a week and she doesn’t eat red meat. Tried this last night… I’m not much of a cook but trying to be better about it and using the Instant Pot is helpful. Husband and I both LOVED this. Came out absolutely perfect! Thank you! I made this tonight. Followed the recipe exactly. I even weighed the ground beef. Carrots and potatoes were perfect, but the meatloaf was not cooked through. I had to finish baking it in the oven. What did I do wrong? Hey – I am not sure. What size pot do you have? I have a 6 qt Duo. Thanks! Ok, then I am really not sure? Did you use 1 1/2 pounds of meat? I did the same and it came out not fully cooked. I’m so disappointed! I’m not sure how to get it to fully cook at this point, either. It looks like I’m going to be sautéing sausage to have instead of meatloaf. ? I’m sorry – what did you do? How long did you cook it for? If it’s not fully cooked, you can put it back in the pot, no? 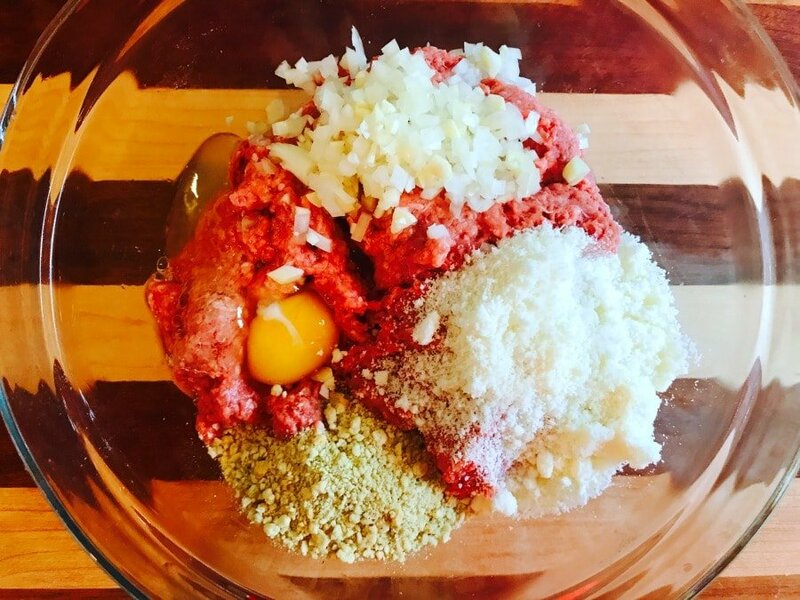 One variation I am going to try is mix and shape the meatloaf first, then brown the meatloaf in the instant pot first (to give it a good searing), remove it, then start with step 1. That could remove the desire for the optional broil step. Ooh – let us know how this comes out! I see that you said it is 6 servings. So did you just divide it all up for 6 portions? Also, for 80 Day Obsession, if I omit the cheese and less butter will that make this 1 green, 1 yellow, 1 red, and 1 tsp? I’m not sure why but my meatloaf came out still pretty red inside. I’m new to the instant pot, so may be user error. Any tips? Oh no! I really am not sure why this happens to some people – I have heard it a couple of times and can’t figure it out! 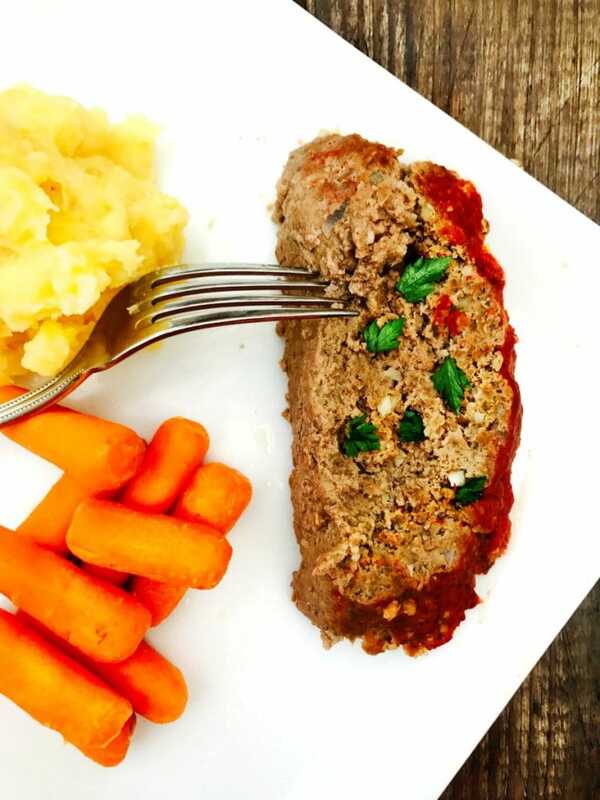 How much meat did you use for your meatloaf? And are you using a 6 quart or an 8 quart? I built the meatloaf around a metal condiment cup. Cooked beautifully, all the way through. It is cooking now… in order to ensure meat is cooked through, i put a metal condiment cup in the middle of the meatloaf. Hopefully, that will make sure meatloaf is cooked through. I love my IP, because the whole dinner is cooking. Last night was bbq baby back ribs, finished under broiler, and corn on the cob. Yum. We have tried at least 4 of your recipes over the past month…including this one. I was skeptical that all three layers would turn out, but this was delicious! So far, all of your recipes have been keepers. 🙂 I love that I can stick with 21DF meal planning, but my husband and kids LOVE your meals too. Healthy, delicious, and Instant Pot…win, win, win!! I can’t see if you mention the size pot. Would it work in a 6qt. Pot ? Just learning – thank you. I tried this tonight and had high hopes! I followed your directions, but my IP never reached pressure and overheated and I got an error message. When I carefully took the layers out, all of the broth was gone from the bottom and the potatoes were starting to burn. Any suggestions for next time? p.s. All of your other recipes have turned out great! I wish I knew for sure, but I honestly think this has to do with having a good seal…if the water was gone, that means it escaped somehow. 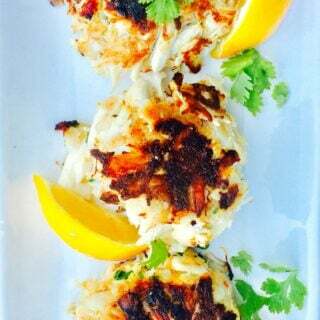 We made this for dinner the other night and it was wonderful !! I am not a meatloaf lover, but I am now ! By for your response!! It turned out awesome!!! Hubby let me have 2 pieces .. he ate the rest!!! LOL! He sounds like my hubby! I’m so glad, Melody! OK I made this last night, per this recipe. Only changes were no garlic cloves with the potatoes, and I added a tablespoon of worsteshire sauce the the meatloaf. I was really delicious, super easy, and a success (2nd or 3rd time using the Instant Pot since we just got it recently. Next time I make it, I’ll probably omit the extra salt added to the potatoes and broth, it simply didn’t need it. Do you think this would work the same if my meatloaf is in an aluminum pan?
? I just made this for the first time. Hands down the best meatloaf ever. I did add my own spices but I prepared it as noted in the recipe and I broiled it as suggested. The texture of the meatloaf is incredible. The potatoes cooked perfectly and were delicious. 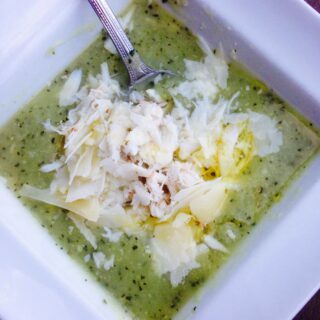 I added a tsp of crushed rosemary to the chicken broth and wow!!! Thank you so much for this recipe. This will be in the meal rotation weekly. It’s really that good. My husband made himself sick because he could not stop ? eating. What other veggies could you use in place of the carrots without changing cooking times? That’s a tough one…most veggies will not hold up to such a long cook time. Perhaps turnips or parsnips? I want to make this, but with 3 teenage boys I fear it won’t be enough. I usually use at least 2 obs of meat, sometimes 3 pounds. Would it work to just cook it longer? Yes – just add a couple of minutes more! What size Instant Pot do you have? Thiss was very good. I used 2 lbs. of beef so I cooked it for 35 minutes. I just made the meatloaf since I had leftover roasted potatoes and I made some creamed spinach. When I formed the meatloaf I made it into a circle around a ramekin. This helped so that any of the fat juices were in the middle of the loaf. This is SO delicious & easy to make. I feel like an Instant Pot pro now. This was my first time layering food in my pot. I love that it is healthy and fits with my container counts. Thank you! Oh my goodness – how did I miss this? You made my whole day, Leslie! Thank you for trusting me and trying this out! This one was fun to do. I felt like a little girl cooking in my play kitchen but for real…LOL. I followed the directions exactly and everything turned out perfectly; nothing over/under cooked…just perfect! Everyone loved it and I found my fiancé eating on the leftovers later that evening. I do have a question, could something be added to the carrots to make them a little sweet? 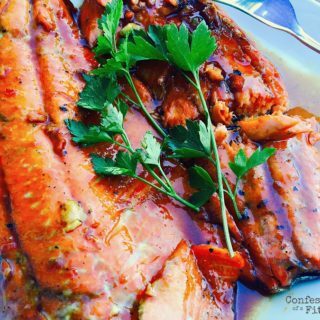 Something to stay 21 Day Fix approved that will work in the instant pot? Alexis, you always have the best comments! I am so happy you enjoyed this one, too, and even the cooking part! To make your carrots sweeter, I would just add some honey or pure maple syrup after cooking! Just a teaspoon or two should work! Just put this in my 6qt and used my delay start for 15 min to get a quick family walk in before dinner on this unseasonably warm Feb day! Can’t wait- we all love it! I’m using a 8 quart pot and 2 lbs of beef. Whst do I need to do different from this recipe if anything? Longer cook time, if so how much time? I made this last night and it turned out great. I am using an 8 quart IP so I used 2 cups of chicken broth (but I don’t think it really needed it in the end but didn’t want the potatoes to stick) and I used 2lbs of meatloaf. I cooked it for 35 min and was perfect. Everything was the right consistency. Thank you so much for this recipe. I thought I was going to have to buy the stackers to cook a meal like this in the IP! Hi Rachel! I am so sorry that I missed your earlier question, but you did amazing here! I am so glad everything workout out and that you enjoyed the meal. So proud! Should the tomato sauce be counted as a purple? Hi! It’s a no sugar added sauce, so I count it as a green! I loved how the potatoes turned out in this recipe. Could I just do the potatoes but with more potatoes. But I’m new to the InstantPot and 21 day fix. Any suggestions for cook time and what setting and what portion of potatoes to broth and garlic. And did you just mash the garlic cloves with the potatoes? Also how to count it for 21 day fix, would it just be 1 yellow container be worth 1 yellow? Sorry for all the questions. Newby here!